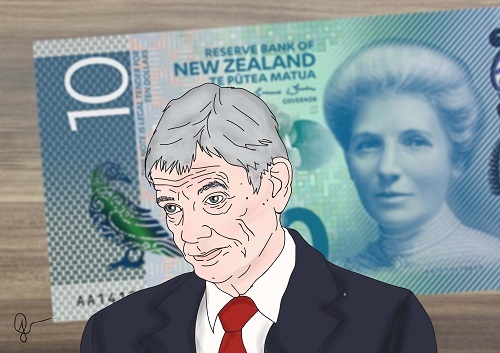 The Reserve Bank (RBNZ) reviews the Official Cash Rate (OCR) and issues a Monetary Policy Statement (MPS) on Thursday for the last time during Governor Graeme Wheeler's tenure. The OCR is expected to be left at its record low of 1.75%, so what the RBNZ says, including about the likely potential future direction of the OCR, will be key. Below is what some of the bank economists are saying ahead of Thursday. ANZ economists Cameron Bagrie and Phil Borkin. (Here's their full preview). We expect the RBNZ to maintain the OCR at 1.75% on Thursday and stick to a neutral bias, in what will be Graeme Wheeler’s final OCR decision as RBNZ Governor. We doubt he’ll rattle the cage, with the tone of the accompanying statement, projections and press confidence to reinforce the RBNZ’s cautious, watchful and neutral stance. ► A case could be made for moving to an easing bias. Core inflation has softened, activity growth is sub-trend, housing market momentum has slowed a lot, a turn in the credit cycle has tightened financial conditions, the NZD has strengthened, and global inflation has rolled over. Local inflation expectation measures will likely be next to soften, driven by falls in headline inflation itself (which to be fair makes somewhat of a mockery of surveyed inflation expectation measures!). Additionally, the RBNZ looks set to lower its near-term growth and inflation forecasts. There is a decent chance that headline inflation will be projected to drop back below 1% again. ► However, medium-term inflation signals are still positive. The terms of trade have surged, forward-looking indicators such as business and consumer confidence point to growth lifting back above trend, the labour market is tightening, and fiscal policy is set to put more money in people’s pockets. While global inflation is rolling over again, global growth nuances have been more positive, with upside surprises of late in China and Europe. Central banks are becoming more attuned to the risks associated with extraordinarily stimulatory policy, despite inflation targets being missed. ► So an easing bias is a leap too far and we think the RBNZ will rely on the flexibility it has within its framework to ebb and flow with recent developments. With each passing day, the impact of secular inflation suppressants is becoming more evident; this is not the time to be a strict inflation targeter. Whether inflation is 1.5% or 2% is a moot point; it’s still low. Rather, the RBNZ simply deserves plenty of credit for the fact that developments have justified the “aggressively neutral” stance it took back in May. ► Overall, it looks like it will be business as usual, with another ultraneutral ‘steady as she goes’ outlook. ► The market’s focus will be on the tone. While we don’t see an outright easing stance, we expect something on the dovish side of neutral – and more dovish than in May. Language regarding NZD strength could be a little more explicit and the implied hikes within the OCR projections should be removed. To be fair, the May forecasts only had one hike at the end of 2019, but removing it would send a clear signal to a market that still has a full hike priced in by roughly August next year. ► On the RBNZ’s broader projections, we suspect there will be an element of ‘looking through the noise’. We doubt the RBNZ has changed its views that the “growth outlook remains positive”. So despite the lower starting point, GDP growth will still be projected to lift towards 3½%. Likewise with inflation. The starting point will be lower, and the RBNZ will need to factor in recent NZD strength and oil price weakness, which will delay the return of headline inflation to the target mid-point. However, the forecasts will still show domestic inflation rising gradually in time. ASB chief economist Nick Tuffley. (Here's his full preview). We expect the RBNZ to sound a more cautionary tone in the August Monetary Policy Statement. The balance of events since the June OCR decision point to less inflation pressure. As a result, the RBNZ’s OCR forecast track is likely to show rate increases will occur in early 2020, 3-6 months later than in its May MPS forecasts. We also don’t completely rule out the RBNZ lowering its 2017/18 OCR forecasts slightly if it wanted to signal that there is a higher risk that it cuts the OCR over the next year. Reflecting the shift in risks, we have also nudged out our own view of when the RBNZ will first lift the OCR, to February 2019 (previously November 2018). In a speech last week the RBNZ indicated it has revised down its average estimate of the neutral OCR (the goldilocks level that is not too high and not too low) to 3.5%. That figure is slightly lower than the 3.6-3.7% published in a Bulletin article just back in June, although that estimate looked like it hadn’t been updated for a number of months. The implications are that the low OCR is not quite as stimulatory as the RBNZ had been assuming. The shift isn’t much, but it is yet another reason for the RBNZ to reassess whether the OCR needs to remain on hold for longer. Over a period of time, the RBNZ’s estimate of neutral interest rates has fallen steadily, having been above 4% as recently as a couple of years ago. To give some context to 3.5% as a neutral rate, the OCR has averaged 3.38% over the past 10 years – including nearly a year of sitting at 8.25%. Since the end of the Global Financial Crisis the OCR has spent less than a year at 3.5%. Westpac chief economist Dominick Stephens. (Here's his full preview). the OCR is expected to remain low for a long while yet, and that there are numerous uncertainties which policy may need to adjust to. In a May media interview, Assistant Governor John McDermott was blunter – he said there is an even chance of a rate hike or a cut in the future. All this is a far cry from financial market pricing, which suggests that the RBNZ is going to start increasing the OCR from mid-2018. The markets’ logic is that the RBNZ will eventually be forced to swim with a tide of rising interest rates, led by the US Federal Reserve. At next week’s Monetary Policy Statement (MPS), we suspect the Reserve Bank will reveal that its thinking has shifted even further from financial market pricing. The RBNZ probably doesn’t intend making a big splash at this point, but we still expect that the tone of the MPS will surprise markets, and could cause a drop in swap rates and the New Zealand dollar on the day. In addition, the Reserve Bank may be conservative ahead of its own leadership handover. The current Governor will leave in September, to be replaced by a caretaker Governor on a six-month term. The process of finding a new permanent Governor will begin after the September election. The one area where we do think the RBNZ will want to be more forthright is the exchange rate. The recent rise to 74 cents against the USD seems out of proportion with New Zealand’s economic conditions, and the RBNZ will not be shy of saying so. The RBNZ could even go so far as to say that if the exchange rate remains too high, monetary policy would have to be more accommodative than otherwise – terminology that it has used in the past. Last week BNZ head of research Stephen Toplis suggested there's a case for the RBNZ to cut the OCR from 1.75%. This, Toplis said, is based on weaker than expected inflation, a strong New Zealand dollar, and a housing market that's softer than the Reserve Bank expected. "A purely mechanistic approach to monetary policy would now argue for a cut in New Zealand’s cash rate," said Toplis. Wheeler's last day in the job is September 26, three days after the election. Deputy Governor Grant Spencer will then be Acting Governor until March 26, when the new Governor is due to start. The next OCR review is on September 28. The latest official inflation figures showed a quarterly seasonally adjusted Consumer Price Index (CPI) reading of negative 0.1% and an unadjusted reading of 0.0%. This brought annual inflation for the year to June to 1.7%, down from 2.2% in the March year. The RBNZ's own forecast of 0.3% quarterly inflation came in its May MPS. Below is the RBNZ June 22 OCR review statement. Global economic growth has increased and become more broad-based. However, major challenges remain with on-going surplus capacity and extensive political uncertainty. Headline inflation has increased over the past year in several countries, but moderated recently with the fall in energy prices. Core inflation and long-term bond yields remain low. Monetary policy is expected to remain stimulatory in the advanced economies, but less so going forward. The trade-weighted exchange rate has increased by around 3 percent since May, partly in response to higher export prices. A lower New Zealand dollar would help rebalance the growth outlook towards the tradables sector. GDP growth in the March quarter was lower than expected, with weaker export volumes and residential construction partially offset by stronger consumption. Nevertheless, the growth outlook remains positive, supported by accommodative monetary policy, strong population growth, and high terms of trade. Recent changes announced in Budget 2017 should support the outlook for growth. House price inflation has moderated further, especially in Auckland. The slowdown in house price inflation partly reflects loan-to-value ratio restrictions, and tighter lending conditions. This moderation is projected to continue, although there is a risk of resurgence given the on-going imbalance between supply and demand. The increase in headline inflation in the March quarter was mainly due to higher tradables inflation, particularly petrol and food prices. These effects are temporary and may lead to some variability in headline inflation. Non-tradables and wage inflation remain moderate but are expected to increase gradually. This will bring future headline inflation to the midpoint of the target band over the medium term. Longer-term inflation expectations remain well-anchored at around 2 percent. And below are the key forecast variables from May's MPS. Well anyone with with a bit of sense shouldn't be looking at just his household budget in isolation and multiplying that into a Nation's economic outlook. The Modern Economy IS the sum total of households. If it weren't then Consumerism wouldn't be the pillar on which it all rests. Exactly the key word here is "sum" What the author appears to be doing instead is multipplication ie taking his one household budget in isolation and multiplying it and making an erroneous assumption on the economy rather than taking all the differing budgets/expenditures and adding them. Another stellar example of why John Mauldin should not be listened to. Depends on how you interpret what he says and in what context. I think he's spot on: Being able to understand inflation is about actual real impacts on an individual and most individuals would prefer to exchange less rather than more in exchange for goods or services. The simple answer my interpretation is, he is pretty much always wrong in how he looks at things. The thing is the OCR is set on the NET effect of inflation in the whole economy and not on one cherry picked person's costs. What in effect he is advocating is pushing up interest rates and doing so will cause a recession and maybe even a sizable depression. Hopefully / fortunately there is no one taking any interest in him. That's right. The CPI has nothing to do with an individual's perception of costs and how it relates to that individual's behavior. Inflation and the CPI is nothing more than a construct. What is more real? It isn't an argument of you can interpret things differently in economics. As far as the theory goes, it's pretty black and white. Understanding inflation is important. It should be a priori for any rational decision making. However, interpreting it in the way JM outlines it above is completely wrong. This isn't theology. It isn't an argument of you can interpret things differently in economics. As far as the theory goes, it's pretty black and white. Understanding inflation is important. It should be a priori for any rational decision making. I agree, it isn't theology; It's about behavior. When you bandy around words like "theory" and "rational decision making", you're already stepping into what you believe in. These words do not necessarily work with behavioral economics in a real world sense. Mauldin is referring to how individuals are likely to perceive prices and its implications for behavior. At this point the RBNZ is beginning to look like a dooms day'er; if we keep saying inflation is coming one day, eventually, we will be right. "we" not for me. My view is we will not see significant inflation in my lifetime, unless the RB / Govt does something exceedingly stupid, or desperate ie a black swan event. If we aren't going to have much inflation, then wages can't really rise much, and would have to rise in line with inflatoin. Much of inflation should be paying for those wage rises though increased service costs. The fact is that local governent rates usually go up by significantly more than inflation, often by up to 5% a year. But this doesn't seem to be factored in at all. Something doesn't add up here. I'm guessing that the OCR rate will remain the same, though if house prices continue to fall, then they my look to lower their rates slightly to try to encourage the banks to lower their mortgage rates so FTB' s can try to keep up with massively over inflated house prices. Makes more sense to let the market bottom out and return to affordable levels. I think house prices would need to fall a long long way before there was any effect on rates. There would need to be a clear and material adverse effect on the wider economy before that happened. RB is clearly of the view that current prices and the current levels of household debt are unsustainable and frankly dangerous, they won't support them. I am not sure many FHB want to get into that sort of debt these days. Having a nearly 1 million dollar mortgage hanging over your head must be pretty stressful. Especially if there is a risk of the house being worth less than you paid. QE II effect is not going away soon. With the Housing market cooling, no chance of an increase. These types of decisions though shouldn't be influenced at all by politics. Yes, there is a high probability of that occurring. The actions of the RBA (Australia) are worth taking note of. At this point, both central banks are between a rock and a hard place. On the political front, you will be told how glorious things are relative to the rest of the world. In reality, you will have no idea of how the magnitude of that perceived glory is attributed to the continuous bubble economics dominating the world. My gut feeling is that the "bubble economics effect" is much greater than most people think. "My gut feeling is that the "bubble economics effect" is much greater than most people think." yes but I am not sure my context is the same as yours. If we didnt have this "bubble" we'd already be in the Greatest depression since the 1870s. That sounds about right to me, to normalize debt levels would required such write downs that not a bank on the planet would be left standing. Mind you, assuming it didnt result in war, I think long term it would actually be beneficial. Ive read about debt jubilees and I think some variants would have a chance of avoiding a total melt down. the thing about a debt jubilee is its really a promises jubilee. Given the interconnected finance web now, a mass global scale debt jubilee is not simple or feasible. There was an interesting alternative I really liked suggested by Steve Keen. The idea is the Government prints say $100k (or whatever amount) for each person gets that with the provision that it has to go to paying down debt first. This would be a one off payment so in theory there would be no long term inflationary expectation and no defaults or significant losses. If we didnt have this "bubble" we'd already be in the Greatest depression since the 1870s. Really? Are you a clairvoyant? I'm sure the politicians would like it if everyone believed in bubbles and their powers, particularly for the need for them to be orchestrated by institutions. You have heard of quantitative easing right? I'm not talking about QE. I'm talking about how you know what will happen without a never-ending series of bubbles and priming of the conditions for bubbles. How do you know the eventualities without supernatural powers? However, I know it's contentious. Many will argue that there are no bubbles. Oh and not only real examples, but pretty sound macro economics, ie Keynes. Based on history its a reasonably sound opinion. The last example is Obama's QE, it is pretty clear that if he had not done QE then a depression like 1929 would have occurred in 2008. You may well wish not to agree but you know try and put forward some evidence to support your view point. As an example of the opposite to QE is austerity and when the new Tory Govn in UK did it they tanked their economy and had to back track fast. OK it's a "sound opinion based on history". It's not a matter of whether I agree or disagree. I cannot produce "evidence" to suggest a "great depression" would not have occurred without the continuation of a the bubble economics paradigm. Neither do I possess supernatural powers. However, what you're appear to be saying is that perpetual bubble cycles are necessary to prevent negative economic conditions. Isn't that thinking a bit circular? Does seem awfully like yet another example of kicking the problem cans down the road for someone else to pick up in future. Based on history its a reasonably sound opinion. The last example is Obama's QE, it is pretty clear that if he had not done QE then a depression like 1929 would have occurred in 2008. You may well wish not to agree but you know try and put forward some evidence to support your view point. OK it's a "sound opinion based on history", whatever that means and however you want to frame it. It's not a matter of whether I agree or disagree. I cannot produce "evidence" to suggest a "great depression" would not have occurred without the continuation of a the bubble economics paradigm. Neither do I possess supernatural powers. Flat I think, its not that bad yet and the RB has this inbuilt tendency to refuse to drop rates even when the bleeding obvious is staring them down. Following in the footsteps of Japan? Kicking the can down the road hardly qualifies one to be in receipt of a $660,000 plus salary. In my view, Japanese Disease -- low growth and low inflation -- was caused by avoiding structural adjustment after the bubble economy burst. Banks and companies in financial difficulties were propped up by loose monetary and fiscal policies, and private households were protected against adverse consequences. Hence, although land values plunged and the Nikkei Stock Index dropped 55 percent between the end of 1989 and 1993, the Japanese economy did not fall into recession. The global policy response to the Great Financial Crisis of 2007-08 broadly followed the Japanese pattern and has thus created a similar environment on a global scale. Emergency liquidity assistance by central banks in the wake of the collapse of Lehman Brothers averted a collapse of the financial system. The operation was similar to defilibration in case of cardiac arrest, and it was very successful. On the one hand, low interest rates seem to foster a low wage, low productivity, low capital investment environment for trading and productive industries; and a high debt, high asset price environment for property on the other. It seems to be a fairly stable pattern. The question becomes what would upset the stability? The central banks putting interest rates up would wreck the high debt environment and cause unemployment, so political pushback would occur long before the benefits of greater capital investment by profitable businesses. I assume here that it goes something like this; higher interest rates cause property price declines and reduced household consumption and increased household debt repayment. Reduced household consumption causes increased unemployment, this causes increased government borrowing and eventually a decrease in the exchange rate. Then profitable businesses start to expand and invest and things to pick up, but there is a lot of misery before the sunlit uplands come into view. What else might upset the long, slow but relatively comfortable decline? A Trump like popular demagogue? Perhaps they will seem fairer and be called Jacinda and champion the cause of the downtrodden masses? Perhaps they actually do make sensible changes, and, against the odds, solve the debilitating problems that face us? Either way, first the misery of change and then the sunlit uplands of a fairer, nicer, and more successful society. If some outside force intervenes to raise inflation to 2 percent, the BOJ will declare that it hit the target, but it’s pretty clear it has absolutely no idea how to engineer a deliberate rise in inflation. This has remarkable parallels with National's approach to and announcements around the Housing Crisis.